Look out Pizza Hut. There’s a new pizza box in town, and it’s about to rival your collectable boxes. Push For Pizza, an app dedicated to getting pizza delivered to customers fast, has partnered with the Nikolas Gregory design studio to make a pizza box that knows the true heart of pizza/stoner culture. The pipe itself is made out of material that can be recycled, making it an environmentally friendly choice on top of a convenient one. 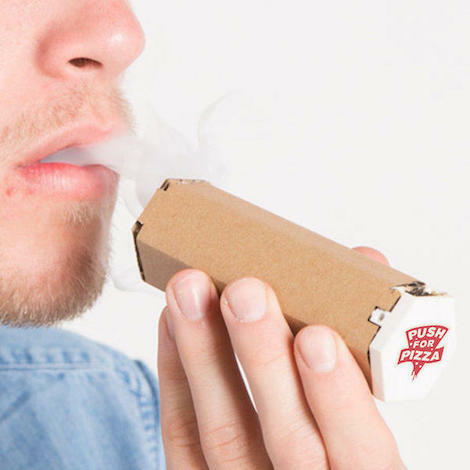 Plus, you’re finally getting some use out of a pizza box you probably would have just thrown out anyways. Before you get too excited, The Verge notes that the pizza box isn’t going to be widely available anytime soon. Push for Pizza is considering doing a “limited run” of the box depending on how the public perceives the product.